What Day Of The Week Was May 22, 2004? 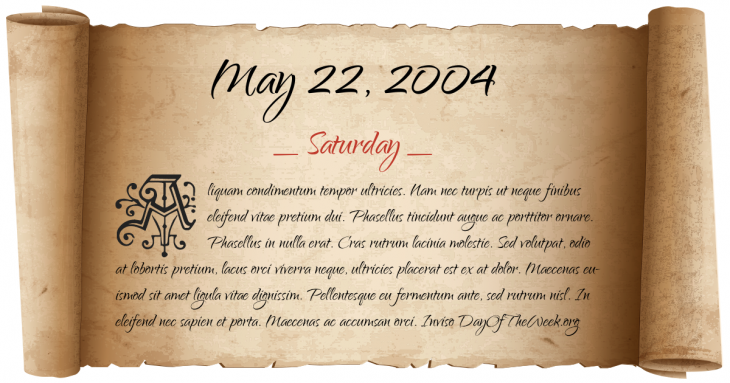 May 22, 2004 was the 143rd day of the year 2004 in the Gregorian calendar. There were 223 days remaining until the end of the year. The day of the week was Saturday. A person born on this day will be 14 years old today. If that same person saved a dollar every day starting at age 7, then by now that person has accumulated $2,889.00 today. Here’s the May 2004 calendar. You can also browse the full year monthly 2004 calendar. The U.S. town of Hallam, Nebraska, is wiped out by a powerful F4 tornado (part of the May 2004 tornado outbreak sequence) that broke a width record at an astounding 2.5 mi wide, which kills one resident.